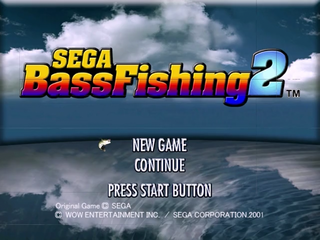 Sega Bass Fishing 2, known in Japan as Get Bass 2 (ゲットバス2), is the sequel to Sega Bass Fishing (Get Bass). It was released for the Sega Dreamcast in Japan and North America in 2001. On the Dreamcast there are also more customisation options. Main article: Sega Bass Fishing 2/Magazine articles.